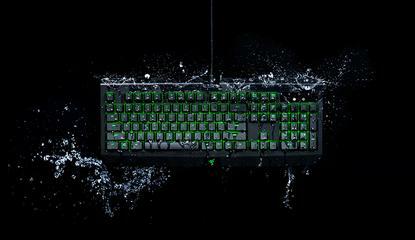 Augmented with water- and dust-resistant features, the latest Razer BlackWidow Ultimate is redesigned to be the most resilient gaming keyboard to date. With an IP54 rating, the keyboard has been tested to protect against accidental water spillage and harmful dust particles. The Razer BlackWidow Ultimate continues to boast individually backlit keys. Each green LED is easily customisable through Razer’s Synapse software, which offers a wide range of dynamic lighting effects which include: Wave, Ripple, Reactive, Starlight and more. Gamers are able to create various lighting profiles via the advanced lighting effect configurator. The Razer BlackWidow Ultimate also comes equipped with the award-winning Razer Mechanical Switches, the world’s first key switch designed specifically for gaming. Available for this keyboard in a single switch variant – the Razer Green Switch – Razer continues to lead the industry with gaming optimised actuation and reset responsiveness. With a rated lifespan of up to 80 million keystrokes, the Razer Mechanical Switch is engineered for durability and reliably delivers top performance with every key press.